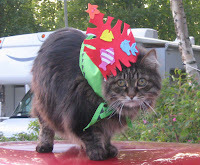 Marie Mosely Plummer, of Wasilla Alaska, knows all about Forever Cats. For the last 16 years she has shared her life with one…SimbaKitty…who was actually born on the same day she landed in Alaska for the first time. Talk about something that was meant to be! Marie told me that SimbaKitty is coming to the end of his journey with her. Anyone who has ever loved a critter understands how heartbreaking this is. 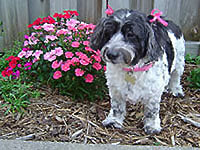 Our animal companions can often live for a very long time, but it’s never long enough. My kitties and I are sending lots of purrs and hugs to Marie and SimbaKitty. My beloved angel dog, Jake, loved cats – it was he who found the litter of kittens under my deck, brought them in, and raised them as his own. It is those four 11-year old cats with whom I share my life. I like to think that Jake takes a special interest in all the new heavenly kitty arrivals. So one day, when SimbaKitty finds himself heading up to those starry skies, perhaps Jake will be there to greet him and welcome him home. Marie,I’m so very sorry. If SimbaKitty left you today, at least you can find comfort in knowing the very last thing he experienced on this earth was being with you, his forever person, and feeling your love.